Martin Luther King Jr. read the words of the apostle Paul to the church in Rome—"Be transformed by the renewing of your mind"—as a call not to retreat from the world but to lead the world into the kingdom of God, where peace and justice reign. In King's day the presenting problem was entrenched racism; the movement of God was a revolution in civil rights and human dignity. Now Adam Taylor draws insights from that movement to the present, where the burden of the world is different but the need is the same. Jim Wallis writes in the foreword, Mobilizing Hope "is a story of how Adam and many of his cohorts are shaping the next strategies for faith-based social change; a theology for social justice; a spirituality for young activists; a handbook for those who want to experiment with activism and search out their own vocation in the world; and a strategy manual that draws lessons from past movements for change." See what today's transformed nonconformists are doing at home and abroad to keep in step with the God of justice and love, and find ways you can join the new nonconformists in an activism of hope. "Adam Taylor is a movement-builder and hope-mobilizer. In this inaugural book he dares us to nonconformity, for it is the duty of every Christian and person of conscience to disobey ungodly laws and to interrupt unjust systems and to live in ways that do not compute to the patterns of this world that are out of line with God's upside-down kingdom. May it inspire you to live with imagination and to do something with your life that moves this broken world a little closer to God's vision of beloved community." "With this inspiriting first work, Adam Taylor calls his own generation to meaningful action, deftly locating them in the continuum, rather than the malaise, of the post-civil rights generations. He offers the young Christian reader a practical methodology for social activism rooted in the teachings of Christ and informed by the examples of Martin Luther King Jr., Archbishop Desmond Tutu and the apostle Paul. Taylor challenges and upends the pervasive notion that narcissism and cynicism define his contemporaries, and provides a comprehensive field guide for their burgeoning hope." 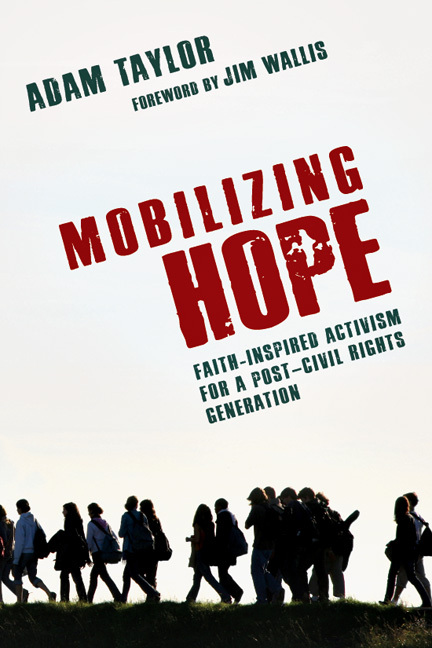 "In Mobilizing Hope, Adam Taylor issues a most compassionate, compelling and courageous call for a new generation of transformed kingdom-focused nonconformists and activists committed to social and economic justice as the saving grace of America. He draws upon his own homegrown roots as a student of the 1960s civil rights movement's messages and methods. Yet he recognizes that today's young leaders will frame strategies that fit new times. His bottom line, and that of God's people of diverse backgrounds, must be to ignore society's seductive call to conform and answer the gospel call to dismantle injustice wherever it is found." "Adam Taylor has written a beautiful, inspiring book. The message is pure and true: faith transforms people, and transformed people can transform the world. For me, reading the book was itself a transformative experience, a necessary reminder of how my own faith inspires and commands me to change injustice into justice, callousness into compassion, conflict into cooperation." "I highly recommend Mobilizing Hope to men and women who are crazy enough to believe that our faith should lead to action, and that our action offers hope for a transformed society. 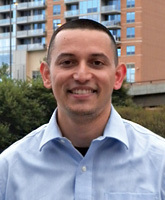 Adam is a dynamic young leader with much wisdom to offer those of us engaged in the complexities of seeking justice." "Adam Taylor's Mobilizing Hope: Faith-Inspired Activism for a Post-Civil Rights Generation will likely be one of the prompts that we've long needed to calibrate our moral compasses and the spark we've needed to refocus our attention on reconciliation and justice in the post-civil rights era. This book speaks to the new generation of leaders, as well as the vanguard, about what it takes to transition from service to activism and what each of us needs to do to find a voice that is clear and truthful in the twenty-first century." "Adam Taylor makes a powerful case for a new chapter of activism for the common good, and he provides practical guidance for those who heed the call. Taylor treasures his heritage; he also understands the hopes and fears of a new generation about civic engagement. By candidly and perceptively addressing these matters, Taylor creates a new conversation and points toward a better day." "This inspiring book clarifies the call for Christians to join with God in restructuring societal institutions so that justice will pervade the earth and the oppressed will enjoy deliverance. I give this book two thumbs up!" "Adam Taylor's daring manifesto calls a new generation of faith leaders to become Christ-centered activists for love and justice. Inspired by Martin Luther King Jr.'s dream, Taylor's Mobilizing Hope offers a bold, vivid vision that energizes and equips Christians to live into a prophetic, intercultural future." "In Mobilizing Hope, Adam Taylor challenges Christians to embrace St. Paul's call not to conform with the ways of the world but to be people of conviction and action and hope. The book offers practical examples and ideas for putting our faith to work on behalf of the poor and oppressed." "Adam Taylor is a true prophet of our time. From the halls of Harvard to the West Wing of the White House to the streets of Zimbabwe, he has been a consistent voice for justice and righteousness. His message echoes the Old Testament prophets who were unafraid to speak truth to power. But Taylor's secret is he knows movements don't start in the halls of power, they end there. In Mobilizing Hope, Taylor shares how our generation can birth a new Spirit-led movement for justice." "In recent years, there has been an evangelical resurgence in social concerns. This renewed interest has resulted in a new generation of believers seeking to live out the biblical call for social justice. Adam Taylor is an individual that has engaged on all levels of biblical social justice. This theologically reflective and historically thoughtful book is the result of an embodied life of justice. Mobilizing Hope reveals the very best of what the next evangelicalism can be. Passionate about Jesus with a deep sense of God's heart of justice for the world, Adam's work challenges all of us to live an authentic spirituality and a lived theology for the sake of the gospel and the world." "I'm proud to see the struggle to build God's beloved community continue through the creative maladjustment of a committed minority of transformed nonconformists highlighted in these pages." "From now on, whenever I meet those eager and seeking young people who want their faith and their lives to make a difference in the world, I have a book to recommend. And I commend it to you. It could change your life." "Adam has become my friend, kindred spirit and younger soulmate in the movement to put faith into action. Mobilizing Hope is . . . a manifesto for this generation which is such a sign of hope for me." "Recommend Mobilizing Hope especially to college students, campus ministers, parachurch ministry leaders, and youth directors." Adam Russell Taylor is vice president of advocacy at World Vision, USA. He recently completed a yearlong fellowship at the White House, and he formerly served as the Senior Political Director at Sojourners, where he was responsible for leading the organization's advocacy, coalition building, and constituency outreach. He has also served as the executive director of Global Justice, an organization that educates and mobilizes students around global human rights and economic justice. Before cofounding Global Justice, he worked as an associate at the Harvard University Carr Center for Human Rights and as an urban fellow in the Department of Housing Preservation and Development in New York City. Taylor is a graduate of Emory University, the Kennedy School of Government, and the Samuel DeWitt Proctor School of Theology. He is also an ordained associate minister at First Baptist Church in Washington, D.C..